If you enjoy people doing everything out of the ordinary, then Brian Naylor is your hero. This congenial Stockport motor dealer entered the World Championship five years running, and he did it all by himself - even up to fielding his own car. Brian Naylor was a director of six companies, all in the motor trade, and during his motor racing career extending from 1953 to 1961 raced a diverse selection of cars, all of which were prepared at his Wellington Road South premises in Stockport. Quite a star in national racing, he started his career with a Bristol-engined Alta in 1953 and jumped into a 500cc Cooper-Norton and Cooper-MG sportscars the following year. In 1955 he was seen at the wheel of two different Lotus Mk8s, an MG 1467cc-powered car and an ex-Coombs car with a Connaught engine. In British club events that year he scored a magnificent 13 first places and seven seconds. Towards the end of 1955 Naylor imported a new Maserati 150S sports-racing car with a 1484 cc twin overhead camshaft engine - in simple terms a version of the Maserati 250F Grand Prix engine minus two cylinders. The Maserati was a substantially built car aimed at continental endurance racing - in British short-circuit events it proved too heavy to beat the Lotus and Cooper opposition in 1956. To overcome this, Naylor's faithful mechanic Fred Wilkinson transferred the Maserati engine and gearbox to a Lotus Eleven chassis. After some early problems, Naylor enjoyed an exceptionally successful season, scoring 27 firsts in British events and a class win in the Leinster Trophy. Abroad, he competed at Imola, where he retired with brake failure, and at Rome, where he finished fourth overall, taking a class second. In 1957 he moved on to a Lotus Eleven powered by a Maserati 200S 2-litre engine and his run of successes continued, including class wins in the Spa Grand Prix and in the sportscar race at the British Grand Prix meeting at Silverstone. In September, at the Goodwood meeting, a weld attaching the lower left-hand front wishbone failed, causing Naylor to lose control and crash severely. The Lotus was a write-off and Naylor suffered a broken leg. Accordingly, Naylor and Wilkinson decided to build their own car for 1958 to which they transferred the engine and gearbox from the crashed Lotus. Fred Wilkinson's chassis design closely followed that of the Lotus Eleven, but the Eleven was a notoriously fragile design and so the JBW ('JB' were Naylor's initials and 'W' stood for Wilkinson), in the words of Naylor "was of much stronger tubing to take the power and weight of the 2-litre Maserati engine". The intention was that the body styling should combine the "better parts" of Lotus and Ferrari "Testa Rossa" with Aston Martin DB3S frontal treatment. In fact, the bodywork looked rather odd, with high front wings and a low nose having the air intake angled downwards. The car was painted green with a red stripe. Naylor drove the JBW-Maserati on its debut in the British Empire Trophy at Oulton Park finishing third in the 2000cc heat to a brace of Lotus 15s and taking fifith on the final. The following weekend Naylor crashed his Cooper Formula 2 car at Aintree (the Cooper 43 F2-23-57), so racing activities were divided between the two categories, the JBW not making that many appearances for the remainder of the year. Naylor did enter the JBW in August at the Roskilde Ring in Denmark, in a series of races held over two days. In the first of the Saturday races Moss' Maserati broke a con-rod and took over the JBW for the second race of the day, coming through from the back of the grid to win. Apart from this, for 1958 Naylor entered 21 races, winning 14 of them and gaining a further two seconds and thirds. And we are still talking about a semi-professional driver here! In 1959 Wilkinson designed and built the first JBW F1 car - plus a very curious JBW-Ferrari sportscar fitted with an ERA gearbox. The F1 design followed Cooper lines but had a four-cylinder Maserati 250S engine and a five speed transaxle. In 1959 it was entered in just three F1 races, all in Britain. It retired in the International Trophy, ran as high as 11th in the early stages of the British GP before retiring with a broken transmission and it was a non-starter in the Oulton Park Gold Cup following a crash in practice. 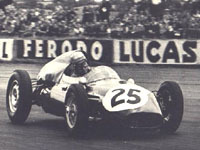 Besides that it was entered more successfully in several Libre events, the high-point of which was the early-September Libre meeting at Snetterton, where Naylor won both a 10-lap single-seater race for single-seaters over 500cc and the 10-lap Scott-Brown Memorial Trophy, in which he also broke the lap record. Naylor undertook a fuller F1 season in 1960, comprising of the International Trophy, Monaco (where he failed to qualify), the British GP, the Silver City Trophy at Brands Hatch, the Italian GP, Snetterton, Oulton Park and the American GP at Riverside. Unfortunately, the car was blighted by retirements. Its best showing was the 1960 British Grand Prix where Naylor qualified 18th from 24 starters and finished 12th, five laps down. This same car was entered in 1961 in Intercontinental Formula races such as the Lombard Trophy, the International Trophy, the British Empire Trophy and the Guards' Trophy, but it was slow in all of them and failed to finish in any. Another JBW F1 car appeared in 1961 and again it was a Cooper copy, this time with a Maserati 150S engine driving through a five-speed Colotti gearbox. On its debut on the Silver City Trophy at Brands Hatch it was over ten seconds off the pace and retired with overheating. In the Italian Grand Prix it ran with a Coventry Climax FPF engine but retired after six laps with a blown engine. It came ninth in the Oulton Park Gold Cup and finally ran in the Lewis-Evans Trophy at Brands Hatch where it retired on the first lap. After this last sorry retirement, Naylor vanished from the records, probably having retired and returning to his car dealer business.